PEACEMAKERS PRAYER PATROLS are asking as many people as possible to join them for the next round of ground patrols. Two new prayer patrols are planned for Bristol. The second ground patrol is set for 13th May 2016, in the Barton Hill area, meeting at 12 O clock midday, outside the Barton Hill Settlement, 43 Ducie Road, Barton Hill, BRISTOL, BS5 0AX . We are hoping for fine weather on both these patrols. Vests and Jackets will be provided for both events. In order to ensure that we bring along sufficient supplies, as well as the right fits, we are asking that potential guests call us prior to these dates, by telephoning Rev on 0750390290 or email us at peacemakersprayerpatrol@gmail.com. 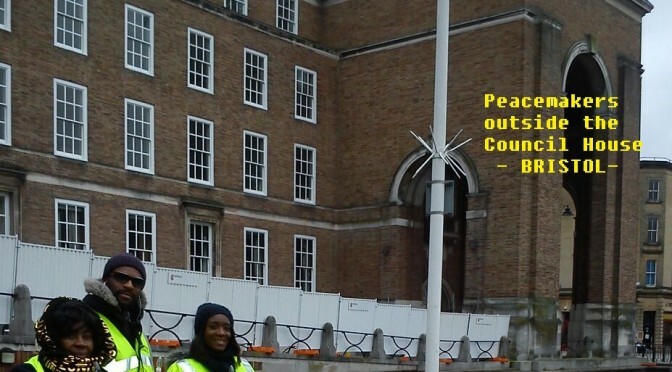 Peacemakers blessing Cities, with two new prayer patrol dates for the City of Bristol.